Aquarium Canister Filter 525 GPH 9W UV Sterilizer SUNSUN HW-304B 200G FREE MEDIA. This External aquarium filter with built in UV system uses a multi-stage approach to filtration and filters your tank water through a number of distinct filter materials that are separated into different layered baskets to provide biological, mechanical and chemical filtration to your aquarium fish tank. These filters work on the same principle as internal powerhead filters, but are positioned outside the tank and draw water into the filter through an inlet tube and return the water via an outlet tube. The outlet tube is fitted with a spray bar to increase aeration within your tank. These type of external filters avoid the need for an unsightly filter inside the tank and the media capacity is much larger than internal filters and they are therefore suitable for much larger tanks. By filtering your tank using the provided filter media you will see a much improved level of waste-free water, strong biological purification and active control of your water characteristics. Thanks to the filters layered basket system and ease of access it is very simple to customize your media choices to suit your aquarium and live stock needs. The built in UV sterilizer exposes passing water to lethal doses of ultraviolet light, killing, sterilizing or otherwise irreparably damaging many micro-organisms. Your fish tank water is pumped slowly past the UV light which is sealed inside a quartz glass sleeve which is designed to allow the maximum amount of UV to pass through the water. 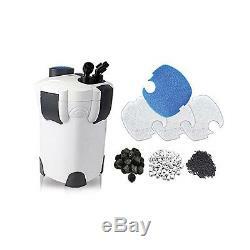 Filter maintenance is very easy as the units drip free shut off tap allows you to move the filter away from your aquarium fish tank to another area more suitable for cleaning. Suitable for fresh & salt water aquarium tanks. 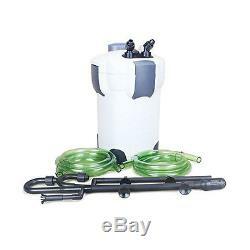 Suitable for tanks up to 175 gallon. Self priming unit, filter fully self primes after simple setup. Drip free shut off tap for easy cleaning. UV bulb on/ off switch provides independent control from filter operation. Four filter media basket compartments for layered filtering. Water Volume: 20 Litres (Approx). Height max: 6.6 feet. Dimensions: 11.5 x 11.5 x 19 inch. (1) Input and Output Discreteness. (1) (9W) UV Light Bulb. (2) 5' lengths of flexible tubing. (1) Joint of Dirtiness Entrance. (1) Carbon, bioball and Bio-ring. We will reply to your message within 12 hours. Listing and template services provided by inkFrog. The item "Aquarium Canister Filter 525 GPH 9W UV Sterilizer SUNSUN HW-304B 200G FREE MEDIA" is in sale since Monday, August 30, 2010. 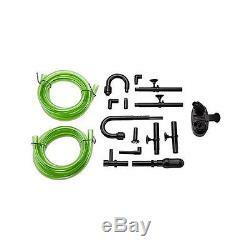 This item is in the category "Pet Supplies\Fish & Aquariums\Filters". The seller is "discountaquatic" and is located in Hacienda Heights, California. This item can be shipped to United States, Canada, Japan, Mexico, Brazil.